Vishvamitrasana is a challenging posture requiring incredibly open hips, hamstrings, and shoulders. With close attention to alignment, Kat leads you through a series of preparatory poses building up to this arm balance. 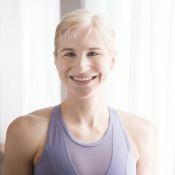 She gives you options for modifying the poses to stay within your capacity and suggests approaching vishvamitrasana with a sense of curiosity and a spirit of getting to know your body, rather than trying to conquer the pose.